Inscription of “Raiho-shin, ritual visits of deities in masks and costumes” was adopted by the committee. 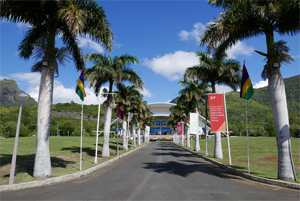 The Thirteenth session of the Intergovernmental Committee for the Safeguarding of the Intangible Cultural Heritage took place in Port Louis, the capital of Mauritius, an island nation in the Indian Ocean, from November 26th through December 1st, 2018. Two researchers from this Institute attended the session. At this session, whether or not “Raiho-shin, ritual visits of deities in masks and costumes” nominated by Japan should be inscribed on the Representative List was discussed. The Committee decided its inscription on November 29th. At the Sixth session of the Intergovernmental Committee in 2011, the similarity of “Oga no Namahage, New Year visiting of masked deities in Oga, Akita” nominated by Japan to “Koshikijima no Toshidon (visiting deity that occurs every New Year’s Eve on Shimo-Koshiki Island),” which had already been inscribed on the Representative List, was pointed out. In response to the decision of the referral of the element by the Committee, ten nationally designated Important Intangible Folk Cultural Properties (protecting groups identified) including “Oga no Namahage, New Year visiting of masked deities in Oga, Akita,” “Paantu” on Miyako Island in Okinawa Prefecture, and “Boze” on Akuseki Island in Kagoshima Prefecture were grouped into the expanded “Koshikijima no Toshidon” as its elements. Therefore, the number of Japan’s intangible cultural heritage elements inscribed on the Representative List remains twenty-one. However, more Japanese cultural properties have been inscribed as UNESCO intangible cultural heritage. It is highly important that “Reggae music” nominated by Jamaica was inscribed on the Representative List among the other properties examined by the Committee this time. Inscription of “Reggae music” might not have been decided at this session since the Evaluation Body initially recommended the element to be referred back to the State Party. However, a discussion by the Committee members resulted in inscription. Japan serves as a Committee member from 2018 to 2022. Also at this session, the Japanese delegation introduced two cases of intangible cultural heritage in need of urgent safeguarding with a focus on Japan’s efforts making a significant contribution: “Disaster Prevention for Intangible Cultural Heritage” on which this Institute works, and “Research on Intangible Cultural Heritage (ICH) Safeguarding and Disaster Risk Management in the Asia-Pacific Region” with which the International Research Centre for Intangible Cultural Heritage in the Asia-Pacific Region (IRCI) deals. Japan is expected to continually make a presence at the Intergovernmental Committee. On the other hand, we felt concerned about how the Committee meeting should be developed. In recent years, referral recommendation by the Evaluation Body is often turned into inscription decision by the Committee. Occasionally, we also came across such cases at this session. 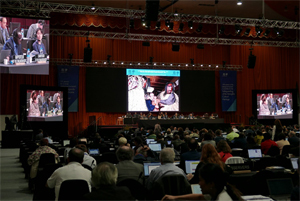 In some cases, proceedings that are not accepted in the guideline for the Convention were decided by the Committee. In fact, some signatory States Parties expressed concern about such a policy of the Committee, causing a stir in its ruling idea for the coming session.